U.S. Special Representative for North Korea Policy Glyn Davies is in China Monday and Tuesday for talks with Chinese officials. According to the Chinese Foreign Ministry, Davies will hold talks with Executive Vice Foreign Minister Zhang Yesui and China’s own Special Representative on Korean Peninsula Affairs Wu Dawei. After leaving Beijing, Davies will spend January 29-30 in Seoul and January 30-31 in Tokyo, according to the U.S. State Department’s press release on the trip. For Davies, the trip might seem like “déjà vu all over again,” as Yogi Berra would say. Davies made similar tours of East Asia in September and November 2013. During both trips, Davies was seeking to build consensus on how to move forward over North Korea’s controversial nuclear program. Little has changed between then and now, except possibly for the worse — the surprise execution of Kim Jong-Un’s uncle raised questions over both the regime’s stability and its future direction, and there is some evidence that North Korea may be preparing for another nuclear or missile test. Meanwhile, U.S. citizen Kenneth Bae remains imprisoned in North Korea, carrying out a sentence of 15 years’ of hard labor (although his recent appearance on camera hints that Pyongyang may be willing to negotiate his release). All in all, the signs are not great for diplomacy, despite recent overtures from North Korea to its southern neighbor (including during a press conference by North Korea’s UN ambassador Sin Son-Ho). In fact, as the Associated Press has reported, Davies’ visit could be taken as a discouraging sign given that China’s Wu Dawei was supposed to visit the United States. That visit was cancelled, potentially a signal of Beijing’s pessimism over such talks. China and the U.S., in particular, tend to rehash the same ground whenever they discuss the North Korea issue. At heart, the two countries have different interests in the peninsula — ultimately, the U.S. would like to see the Kim regime gone, while China places great value on North Korea as a buffer state. Beijing and Washington do agree on the goal of Pyongyang’s denuclearization, given the threat that North Korean nuclear missiles pose to U.S. allies in the region as well as the possibility that they will spark an East Asian arms race. However, even on this point of agreement, Beijing and Washington have different approaches for how to achieve their shared goal. Whereas the U.S. stresses sanctions in an attempt to force Pyongyang to cooperate, China’s leaders insist that only negotiations can be successful. Thus, every time the Korean nuclear issue is mentioned, China is quick to mention the dormant “six-party talks” as a possible solution. Chinese Foreign Ministry spokesman Qin Gang, in commenting on Davies’ visit to Beijing, called on all “all relevant parties” to “create favorable conditions for the early resumption of the Six-Party Talks.” At this point, such comments seem to be little more than a formality — the Chinese government is well aware of the Obama administration’s stance that negotiations cannot resume without initial good-faith steps from Pyongyang. Meanwhile, the U.S. continues to push for Beijing to support additional sanctions on North Korea, as well as more tightly enforcing existing sanctions. There was a glimmer of hope in September, when Beijing published a new list of items banned from being exported to North Korea. Still, as an overall philosophy, China prefers negotiations to sanctions, and this is doubly true when it comes to North Korea — there are concerns in Beijing that, if pushed too far, sanctions could destabilize the Kim regime. On the U.S. side and Chinese side, these arguments largely seem to be rituals, simply raising points that have been made time and time again. In other words, with regards to North Korea, don’t expect a diplomatic breakthrough like the interim Iran deal anytime soon. Negotiations over Iran’s nuclear program were made possible by the arrival of new president Hassan Rouhani, who provided a stark contrast to predecessor Mahmoud Ahmadinejad and his fiery anti-America rhetoric. We’re unlikely to see a similar leadership change in North Korea anytime soon. With all the current major players in place at least until the U.S. 2016 presidential election, it’s hard to imagine Davies having any success in pushing past the policy stalemate. 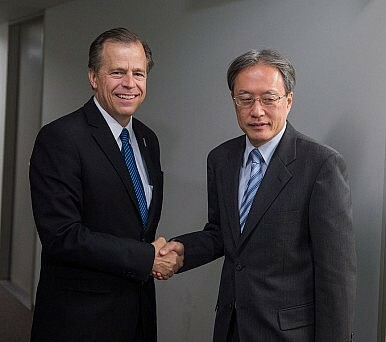 China's special representative on Korean affairs is in the US this weeks for talks with his American counterpart.